Our taste testers love Chewy.com for sending us this product to review. They just wish Chewy.com had sent more! Chewy.com sent us a 3.25 oz package of Blue Buffalo Wilderness Trail Treats in Chicken Jerky flavor in order to try their home delivery of pet food and treats service. 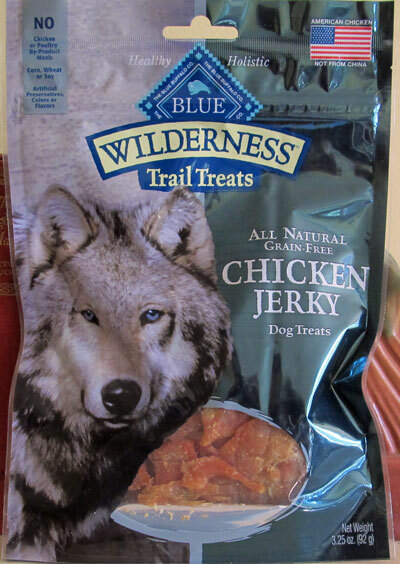 According to their website, Blue Buffalo's Wilderness Trail Treats Chicken Jerky is a chicken strip. All natural ingredients: chicken, dried cane molasses and salt. Blue Buffalo does suggest that Blue Wilderness Jerky Treats be kept in a cool, dry place. Refrigerating after opening is recommended. The Chewy.com web site suggests that these treats are perfect for dogs with food-related allergies or pets sensitive to commonly used treat fillers. They also note that they're so delicious that pets might forget to chew. Jeffie and Rudy would agree with that! This definitely has to be their favorite taste test. As soon as we opened the package, both dogs were eager to begin their duties. The Dog Daddy held them back while I examined the jerky treats. 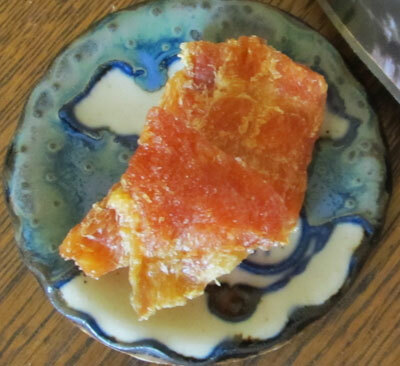 Looks and smells exactly like what it is: dried chicken. 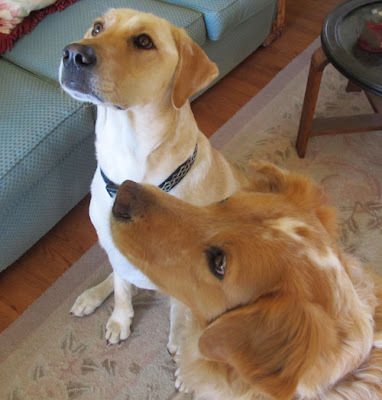 After only the first taste, our soft-mouthed retriever boys couldn't help themselves from trying to chomp another jerky treat. 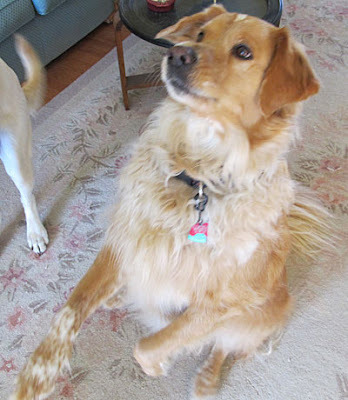 Jeffie tried to get extras by shaking paws. Then he spontaneously sat up to beg for more. Note: this is NOT a trick he's been trained or encouraged to do. This was truly spontaneous and all his own idea. Blue Buffalo is made in the US. These treats do not contain any meat from China (or anywhere else in Asia). All meat is sourced from US meat suppliers. These Blue Buffalo treats are all natural. We're pleased to recommend both Blue Buffalo Wilderness Trail Jerky dog treats and Chewy.com! Click on the graphic below to discover all sorts of new treat recipes, great giveaways and more, because today is a Tasty Tuesday Blog Hop. We may have to try them. We've scratched chicken treats off the list of things we boy the boys, and I know they are missing them. Jeffie and Rudy absolutely LOVED these treats. And I'm not kidding, I'm going to order more for my boys. 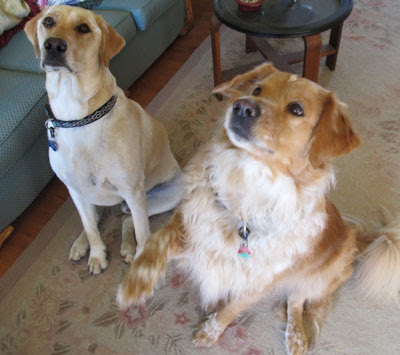 We've never seen them so excited about a treat like these. If you give them a try, let me know how your boys like them. Chicken??? YUMMMMM... and, so great to see the boys enjoying themselves. 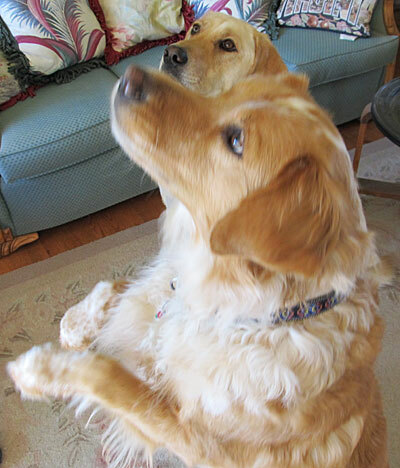 JJ does the double paw thingie too, without training... ah, those goldens, can't get enough of them! Great review. This was the first time Jeffie ever gave sitting up and begging a try! I'm just glad I caught it on camera :-) Thanks, Jet! Fantastic review! I've always thought that Blue Buffalo made great products and the fact that these are made in the US has put them on our shopping list. Thanks for trying them out for us! Thank you! We had never tried Blue Buffalo treats before, but we'll be buying more of these. Let me know how your pups like them! It certainly looks very good for many reasons. My only "complaint" about the product would be the addition of dried cane molasses and salt. Dogs typically have too much rather than too little sodium and the molasses, in my opinion, is not needed and only provides additional source of sugar. I tend to agree with you about the sodium and molasses, Jana. The interesting thing is that these jerky treats smell like chicken - I cannot smell the molasses. Gary took a nibble and said they tasted just like chicken; not sweet and not salty. If this were a dog food, I wouldn't be so keen on it. Since they're treats (and at our house, treats are just that - treats), I do plan to purchase more. Someone who feeds lots of treats... might want to use another product for the very reason you note. Thanks!